Home / The Goodnight Train Rolls On! All aboard! 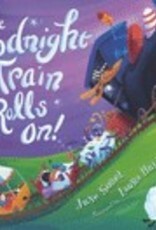 This colorful companion to The Goodnight Train is leaving the station, with new nighttime hi-jinks and all the rhyme and rhythm that made the first book a bedtime read-aloud favorite. When a herd of poky sheep slows the Goodnight Train to a crawl, the Engineer's quick thinking (and counting!) has them rolling along in no time—until one tricky sheep sends the train and its sleepy passengers tossing and turning! The clickety-clack cadence of the poetic text is sure to lull listeners to sleep, but not before they take in the candy-colored landscapes full of delightful Dreamland details to discover. All aboard!